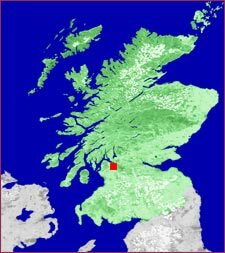 Glasgow is known as The Merchant City. It has a more gritty, industrial feel than many of the other cities we've visited in Europe, including London and Rome. Whereas the middle of the city has been re-dedicated for pedestrians, with brick and cobblestone walkways prohibited to cars, the rest of the city feels somewhat run-down, a shadow of a former glorious self. Indeed, much of the transportation infrastructure, including railway engines and coaches, industrial revolution steam engines off all sorts, clocks, and other such things were made in Glasgow or by Glaswegians. Much of it still runs. It's something of which they're justifiably proud. 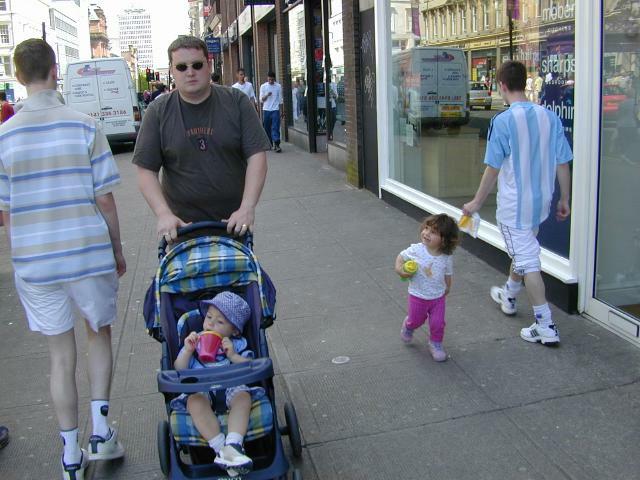 Glaswegians are a friendly people, something one might not expect given the ill-humored look to much of the city. Still, I'm very happy we visited Glasgow. Some of the acquainantances we made will stay with me, and some of the sights and sounds were very pleasant indeed. The Babbity Bowster, a Glasgow public house (pub and rooms) was an absolute delight. 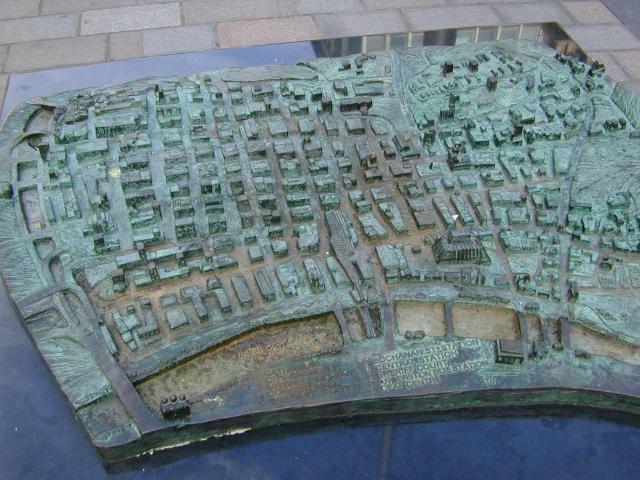 One of the first times I saw a cast metal birds-eye view of a city, was in Glasgow. The Babbity Bowster, our home away from home, is at the left, along the High Street. The River Clyde is along the bottom. The main walking and shopping street is about in the middle of the city, going horizontal. Here you see us leaving the Babbity on one of our many trips. Lila is especially interested in other keiki (Hawai'ian: child), and has no issues with approaching children or their parents. She's especially pleased to be mobile with her sippy cup. 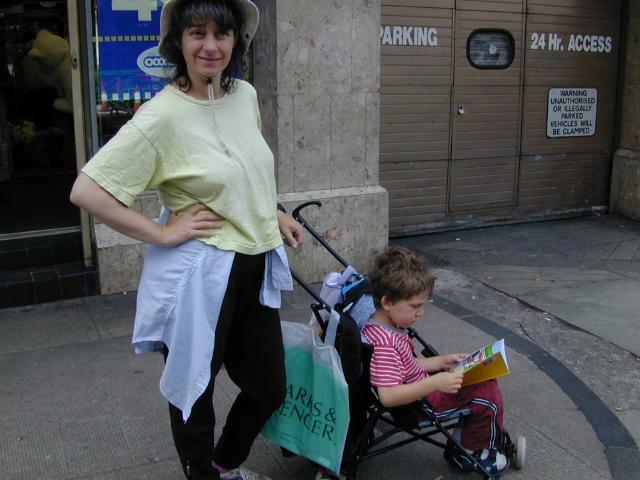 One of our first jaunts was to Marks & Spencer, where we bought inexpensive sandals for Isaac to replace the pair which we'd bought in San Francisco. What happened to them? you might very well ask. Well, as we were exploring a pedestrian suspension bridge in the Glasgow Green, Isaac thought it would be a funny thing to rub a shoe off. Floating in a rather murky branch of the Clyde, we eschewed jumping into the water to retrieve it. "For the best, too," said several passers-by, suspicious of the survivabliity of being in such dirty water. Our next port of call was George Square.